Evolution relies on, depends on, and believes in the "evolutionary story" of the fossil record. Several key facts punch holes in that foundation—the extreme rarity of transitional forms, stasis in the record, sudden appearance of complex animal and plant forms, and gaps between species. Discuss the supposed origin of fish, bats, fleas, flies, birds, dragonflies, marine reptiles, whales, and finally humans. Compare the evolutionary scenario to the creation scenario in which each type was created by a supreme Creator separately and fully formed, just as it is found in the fossil record. Conclude with a summary of the real fossil record and its record of death and extinction. 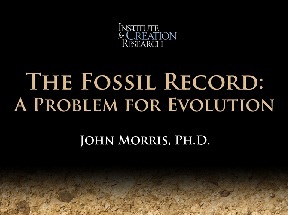 Dr. John Morris, is a creation scientist and educator with a specialization in Geological engineering. He is the current President of the Institute for Creation Research, and son of the late Henry Morris whose seminal work is viewed by many to have initiated the modern creation science movement. John joined the faculty of ICR in 1984, and has served as the President since 1996. He has also led numerous expeditions to Mt. Ararat in search of Noah’s Ark. Dr. Morris received his B.S. in Civil Engineering at Virginia Tech in 1969 and his M.S. in Geological Engineering at the University of Oklahoma in 1977. He received his Doctorate in Geological Engineering at the University of Oklahoma in 1980. Dr. Morris can be heard each day on the Back to Genesis radio program. He is the author of numerous books, including The Young Earth. Dr. Morris taught geology at the University of Oklahoma before joining the faculty of the ICR. Watch video online - This PowerPoint file was used in a seminar that was given by Dr. Morris at the Seattle Creation Conference, October 2010.